Tucked away off the busy Boroughbridge Road, The Willows hosts two secluded, and idylic, lakes set in beautiful surroundings with well established plants and trees. The newer Ridge pool holds 26 spacious pegs, while the more mature Goldrush pool holds 34. The main species in the Ridge pool are Carp to 10lb, Crucian Carp to 2lb, Chub to 2lb, Tench to 5lb, Ide to 3lb. This much loved lake is 3 acres and set among natural, scenic, mature landscaped gardens containing over 5000 trees and shrubs set in approximately 71/2 acres. The land was originally old Clay/Brickworks about 150 years ago and is steeped in history. In part of the garden, facing the main road (A59) there used to stand an old coaching house named the Boot and Shoe. A water well has been erected on the spot where it stood and actually leads down to the original cellars of the pub. You will find this mentioned in many a book written by local historians. Grass Carp to 5lb, Koi to 9lb, Bream to 4lb. 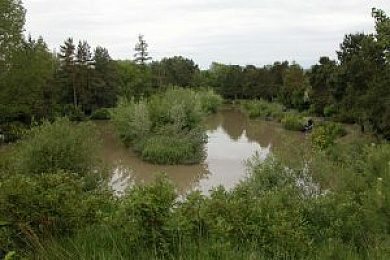 This fish-filled lake has many features such as 9 islands with overhanging trees and rushes with 35 well spaced pegs.